The Muppets finally reach Hollywood. They get past a secretary, Miss Tracy, when their fur causes her to have an allergic reaction, finally meeting studio executive Lew Lord. Lord signs the Muppets to a movie deal, and they attempt to make their first movie as a surreal pastiche of their journey. The first take goes awry when Gonzo crashes into the prop rainbow, breaking it in half and sending it falling onto the rest of the set, while Crazy Harry pulls levers in the control room which overload the electricity circuit, causing an explosion that blows a hole in the roof of the studio. As the Muppets stand in stunned silence, a natural rainbow suddenly shines through the hole and right onto the Muppets. The Muppets, joined by other characters from The Muppet Show, Sesame Street, Emmet Otter's Jug-Band Christmas, and the "Land of Gorch" segment of Saturday Night Live, sing the final verses of "Rainbow Connection." Orson Welles as Lew Lord, a Hollywood producer and studio executive. The character's name is a reference to Sir Lew Grade, head of British company, ATV, which co-produced the original Muppet Show. The main obstacle the filmmakers were faced with during the development of The Muppet Movie was whether the Muppets would transition seamlessly from television to film. In 1978, director James Frawley, Jim Henson, and Frank Oz filmed several camera tests outside London to test how the characters would appear in real-world locations. Austin Pendleton recalled that the film was shot on "a very unhappy set, because Jim [Frawley] was very unhappy directing that movie. And I noticed that was the only time the Muppet people used an outside person to direct a Muppet movie. They never did that again. After that, it was either Jim Henson or Frank Oz. And I would have liked to have been in one of those, because those sets were very harmonious. But this was not." Filming locations included Albuquerque, New Mexico. To perform Kermit static on a log, Henson squeezed into a specially designed metal container complete with an air hose (to breathe), a rubber sleeve which came out of the top to perform Kermit and a monitor to see his performance, and placed himself under the water, log, and the Kermit puppet. He was also assisted in this operation by Kathryn Mullen and Steve Whitmire. This scene took five days to film. Before this, no film had a hand puppet act with its entire body appearing on-screen. That is, hand puppets were only seen from the waist up, and it became a major plot point to show Kermit with legs. To have Kermit ride a bicycle in a full-body shot, a Kermit puppet with legs was posed onto the seat and his legs and arms were attached to the pedals and handlebars. An overhead crane with a marionette system held the bicycle through strong strings invisible to the camera, guiding the bicycle forward. The crane and system was out of the camera's frame of vision. The closing reprise of "Rainbow Connection" featured a crowd of more than 250 Muppet characters—virtually every Muppet that had been created up to that point in time. According to Henson Archivist Karen Falk: "137 puppeteers were enlisted from the Puppeteers of America (along with the regular Muppet performers) to perform every Muppet extant. Prior to the day-long filming of the shot, Henson gave the enthusiastic participants a lesson in the art of cinematic puppetry. Amazingly, it did take just one day." The Muppet Show Fan Club newsletter answered the question of "How did they do it?" The response was "There are 250 puppets in the last shot of the film, and they're all moving. How? 150 puppeteers in a 6' deep, 17' wide pit, that's how. They were recruited through the Los Angeles Guild of The Puppeteers of America and almost every puppeteer west of the Rockies reported for pit duty." In September 1978, Edgar Bergen, Henson's idol who appeared in a cameo role, died shortly after completing his scenes. Henson dedicated the film to his memory. The Muppet Movie uses meta-references as a source of humor, as characters occasionally break the fourth wall to address the audience or comment on their real-life circumstances. In one scene, Kermit and Fozzie encounter Big Bird on the road, offering him a lift to Hollywood, but he declines, heading to New York City to break into public television, referencing the character's role in Sesame Street. The film's music was written by Kenneth Ascher and Paul Williams. Regarding the music's composition, Williams said; "Jim Henson gave you more [creative] freedom than anybody I've ever worked with in my life. I said, 'You want to hear the songs as we're writing them?' He said, 'No. I'll hear them in the studio. I know I'm gonna love them.' You just don't get that kind of freedom on a project these days." The film proved to be a huge hit at the box office during the summer of 1979 and ended up grossing $76,657,000 domestically (adjusted for inflation, this would equal $265,703,546 in 2016 dollars), making it the seventh highest-grossing film of 1979 and also, the second highest-grossing Muppet film after the release of The Muppets in 2011. The success of the film gave Jim Henson Productions an opportunity to release more Muppet productions theatrically. The film's successful theatrical release encouraged Lew Grade into furthering his own film distribution company, which later backfired with the massive box office failures of Can't Stop the Music (from EMI) and Raise the Titanic (from ITC), both released by Associated Film Distribution just a year later. The Muppet Movie received positive reviews. The film currently holds an 88% approval rating on Rotten Tomatoes with an average score of 8/10, based on 48 reviews. The site's consensus says "The Muppet Movie, the big-screen debut of Jim Henson's plush creations, is smart, lighthearted, and fun for all ages." Roger Ebert of the Chicago Sun-Times gave the film three-and-a-half out of four stars. In his favorable review, he was fascinated that "The Muppet Movie not only stars the Muppets but, for the first time, shows us their feet." Vincent Canby of The New York Times offered equal praise, stating that the film "demonstrates once again that there's always room in movies for unbridled amiability when it's governed by intelligence and wit." Leonard Maltin's annual movie guide found the film enjoyable, though he called the score "pedestrian", despite the song "Rainbow Connection" being nominated for an Academy Award. In 2009, it was named to the National Film Registry by the Library of Congress for being "culturally, historically or aesthetically" significant and will be preserved for all time. Walt Disney Studios Home Entertainment released The Muppet Movie as the Nearly 35th Anniversary Edition on Blu-ray Disc and DVD on August 13, 2013. ^ The film's distribution rights were purchased by The Jim Henson Company from ITC Entertainment in August 1984. The rights were then transferred to Walt Disney Studios upon their parent company's acquisition of the Muppets franchise in 2004. The film has since been subsequently released as a Walt Disney Pictures release. ^ Jay Jones, Brian (2013). "Chapter 12: Twists and Turns". Jim Henson: The Biography. Ballantine Books (Random House). pp. 374–375. ISBN 978-0345526113. ^ "THE MUPPET MOVIE (U)". British Board of Film Classification. May 14, 1979. Retrieved July 27, 2015. ^ a b Jones, Brian Jay (2013). "Life's Like a Movie". Jim Henson: The Biography. New York: Ballantine Books. p. 296. ISBN 978-0-345-52611-3. 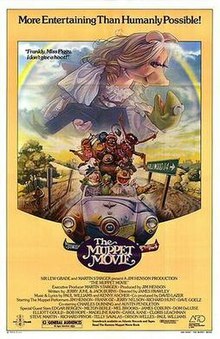 Meanwhile, audiences made it [The Muppet Movie] one of the most profitable films of the decade, grossing over $65 million in its initial release—not a bad return on [Lew] Grade's initial $8 million investment. ^ a b "Box Office Information for The Muppet Movie". The Numbers. Retrieved January 23, 2016. ^ a b Roessner, Beth (March 22, 2014). "First 'Muppets' director recalls original". USA Today. Retrieved September 5, 2014. ^ Rabin, Nathan (July 29, 2009). "Austin Pendleton | Film | Random Roles". The A.V. Club. Retrieved December 21, 2012. ^ 100 years of filmmaking in New Mexico 1898–1998. New Mexico Dept. of Tourism. 1998. p. 118. ^ Swansburg, John (December 6, 2013). "Muppet Man". The New York Times. Retrieved April 10, 2014. ^ "Rainbow Connection". Songfacts.com. Retrieved December 7, 2009. ^ "The Muppet Movie". Rotten Tomatoes. Flixster. Retrieved September 8, 2012. ^ Roger Ebert (November 14, 1979). "The Muppet Movie". Chicago Sun-Times. rogerebert.com. Retrieved February 1, 2012. ^ Canby, Vincent (June 22, 1979). "The Screen: Muppets Go to Hollywood:Roadiest Road Picture". The New York Times. Retrieved September 9, 2013. ^ "25 new titles added to National Film Registry". Yahoo News. Yahoo. December 30, 2009. Archived from the original on January 6, 2010. Retrieved December 30, 2009. ^ "AFI's 100 Years...100 Laughs Nominees" (PDF). ^ "AFI's Greatest Movie Musicals Ballot" (PDF). ^ Truitt, Brian (August 9, 2013). "Kermit, Fozzie entertain in 'Muppet Movie' camera test". USA Today. Retrieved August 12, 2013.